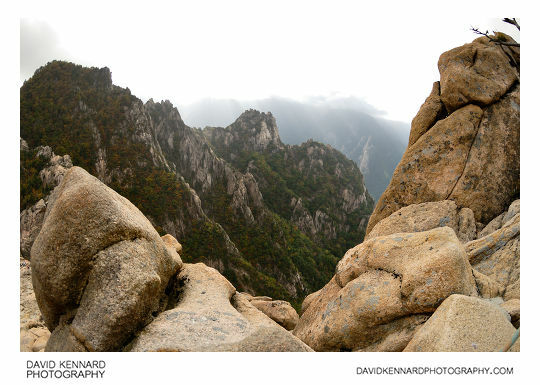 Although I don't remember seeing any of the actual walls of Gwongeumseong, there were certainly lots of rocks around. Quite a few had been piled into small Buddhist stone stupas. Up ahead you can see the peak of Gwongeumseong, the aim being to make the short climb to the top of it. Looking back south along Gwongeumseong (above), you can see the much higher mountain peaks of Seoraksan. You can walk up to the highest peak, thankfully we didn't try it though as we wouldn't have had enough time. I would quite like to go back here another year and try walking up to the highest peak, and some of the other peaks as well. From what I have read (and my very limited experience), the mountain paths are well defined with things like ropes and even metal stairs installed for the steeper bits. Above, the view west while climbing up to the top of Gwongeumseong. 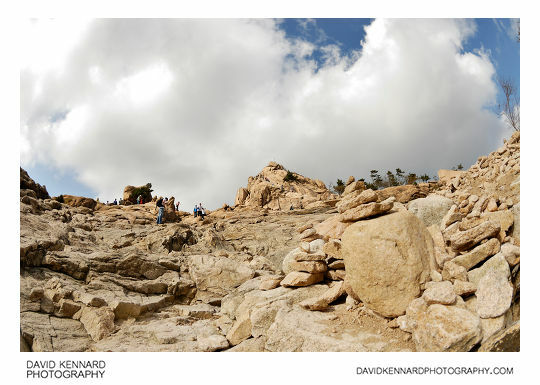 With my heavy jacket full of lenses and other photography accessories, and my tripod, I didn't find the climb that easy. There is a rope you can use to help yourself up part the route, and also some concrete foot / hand holds. 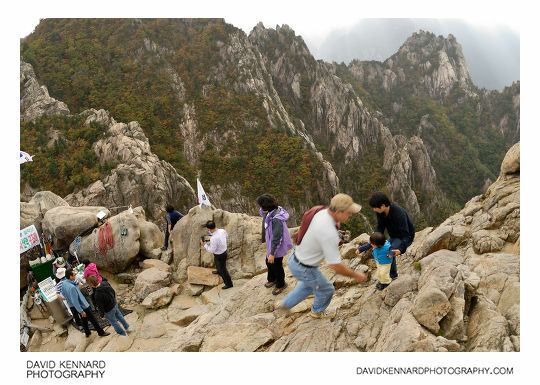 There was also a Korean park official standing right on the edge of the rock (he was safely attached by a rope) smiling and listening to a small radio, making sure everyone could make the climb safely. When you think you've reached the top of the climb, you come into a sort of bowl section, and find there is actually a little way further still to the top. The above photo is taken from near the top and looking back down into this bowl section. There is a man in the bowl section who sells 'gold' medals that parents can buy for their children as a sign of accomplishment for climbing to the top. It seemed quite strange to me having a little stall at the top of a mountain section you can only get to by climbing. But what seemed even stranger was that they'd engrave the child's name on the medal. So you're on top of a mountain and every now and then you'd hear the loud whirring of the engraving drill. As you can see from the image below, it was a nice view from the top. Unfortunately the clouds had got the better of the sun by the time we reached the top. Taking the above panorama was rather tricky as there wasn't much room to move about on top of the rocks, and you had to be careful about where you were stepping. There were also people constantly going up and down and moving around, which I thought would make stitching the shots together difficult. I took around 2 sets of images around because of this, but in the end it wasn't actually much of a problem. 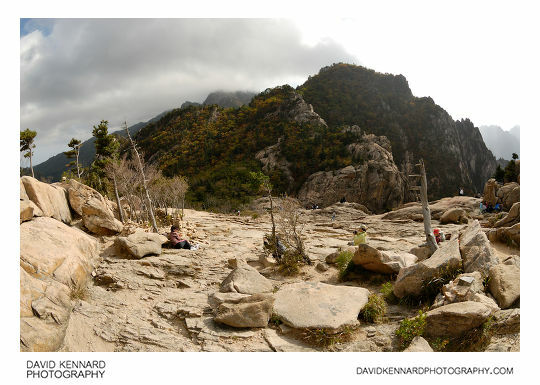 One problem I did have is that I left my photography bag (which wasn't actually used for photography stuff) in the space between the rocks at the bottom of the panorama. I'm not sure why I did this, but after stitching the panorama together, I thought it looked pretty horrible in the equirectangular image. So I cloned it out, which I thought would be very difficult, but turned out not be too bad. I've uploaded the version with the bag to my panorama website, and the version with the bag cloned out is as you see above. Another thing I thought that was quite weird while at the top of the mountain, was that they'd be very young kids walking around up there (one of them only looked about 2 or 3 years old). 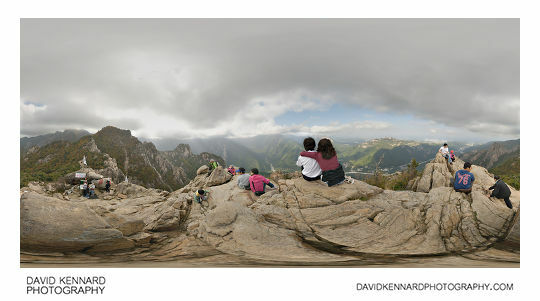 I guess Koreans just get into mountain climbing / walking very young.